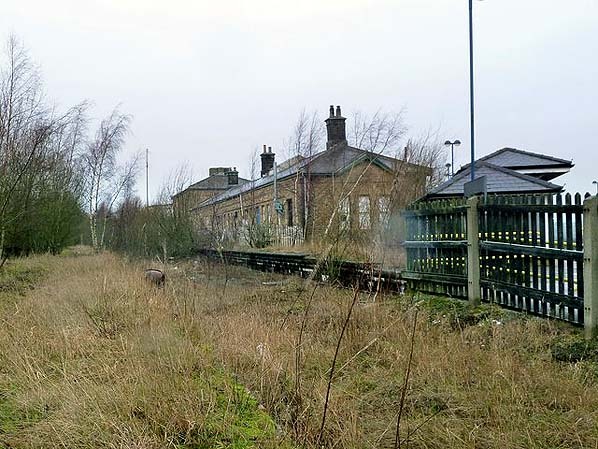 Present state: The overgrown platforms and main station building are still extant. The adjacent electricity sub-station is in industrial use. 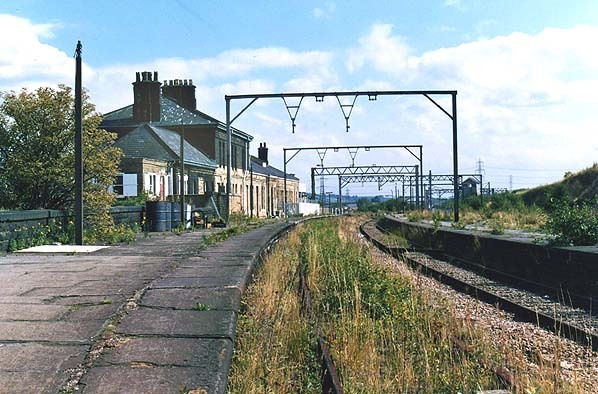 Notes: The first MS & L (Manchester Sheffield and Lincolnshire Railway) station at Penistone opened 14.7.1845. 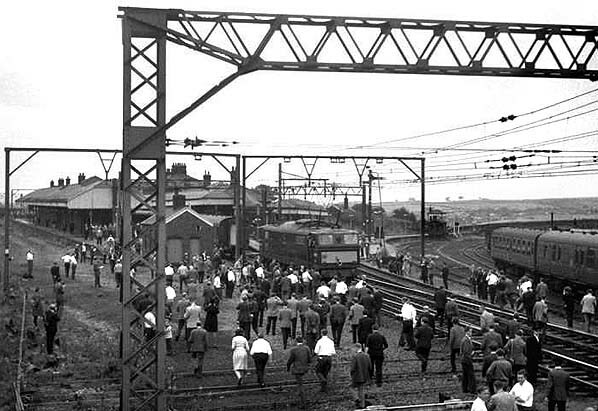 When the L & Y (Lancashire and Yorkshire Railway) service opened on 1.7.1950 it joined the MS & L at a junction east of the station and trains had to reverse into the MS & L station. 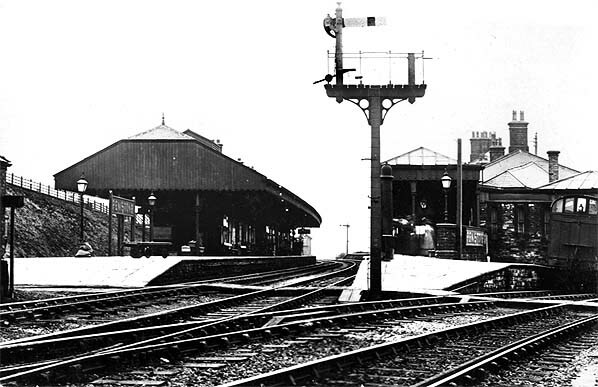 This was replaced by a joint GC & L & Y station at the junction in 1874 with separate sets of platforms. Barnsley, with an hourly train in each direction. Train services are provided by Northern Rail. London Kings Cross, via Worksop, Sheffield and . Huddersfield line, allowing trains coming from Sheffield and Huddersfield to pass each other. the new Barnsley PSB and the box closed - it has since been demolished. The line opened in 1845. It was built by the Sheffield, Ashton-Under-Lyne and Manchester Railway with Joseph Locke as its engineer. In 1847 the railway merged with the Sheffield and Lincolnshire Junction Railway, the Great Grimsby and Sheffield Junction Railway, and the Grimsby Docks Company to form the Manchester, Sheffield and Lincolnshire Railway, which changed its name to the Great Central Railway (GCR) in 1897. Ownership passed to the LNER in 1923, and finally to British Railways Eastern Region in 1948. The original eastern terminus of the line was at Bridgehouses station. By the time of the creation of the Manchester, Sheffield and Lincolnshire Railway in 1847 the station at Bridgehouses had been outgrown. A 1 km extension including the Wicker Arches viaduct, engineered by John Fowler, was constructed to the new Sheffield Victoria Station, which opened in 1851. Both goods and passenger traffic was very heavy and some sections of the line were therefore quadrupled. had inadequate clearance for twin electrified lines. braking by transfer of power from descending to ascending trains in the same section of line comparatively straightforward). 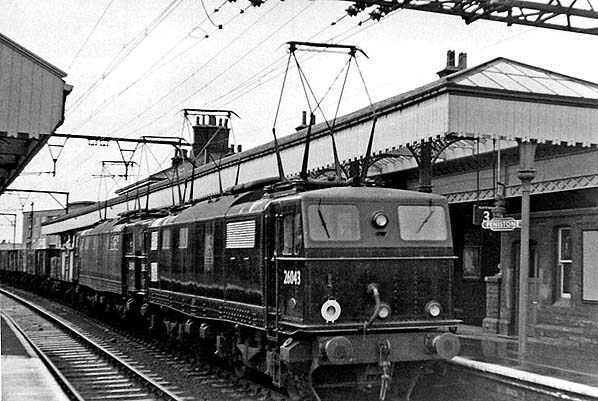 The main contractor for the electrification work was Bruce Peebles & Co, Edinburgh. Following technological developments (especially in France) 1.5 kV DC was soon superseded by the later network standard of 25 kV AC. 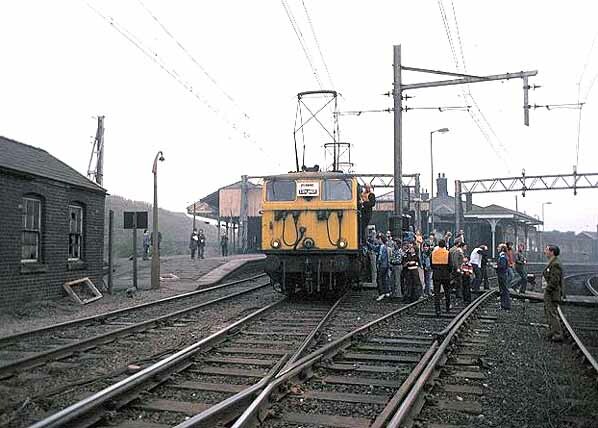 This left the Woodhead Line as the only main line in the UK with 1.5 kV DC electrification New electric locomotives for the line were constructed at Gorton locomotive works, Manchester. These were the EM1/Class 76 for freight trains (and some passenger duties) and EM2/Class 77 locomotives for express passenger trains. Given the steep gradients on the line, the locomotives were able to use regenerative braking on their descent from Woodhead. Rheostatic braking was also later added. 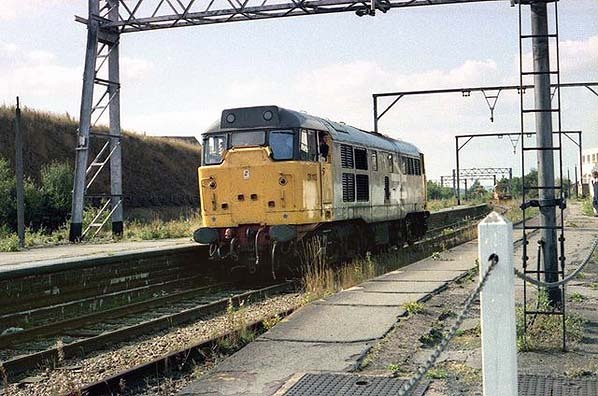 Additionally, Class 506 electric multiple units were built for suburban services between Manchester, Glossop and Hadfield. A new depot at Reddish on the Fallowfield Loop line, was built in 1954 to maintain the new rolling stock. Dearne Valley. These trains were timed to connect with Sheffield-Manchester trains at Penistone. Valley Line through Edale would be required to remain open for social and network reasons and could handle all Manchester– Sheffield passenger traffic. The Class 77 locomotives for passenger traffic were sold to the Netherlands Railways, where 1500 V DC electrification was standard. 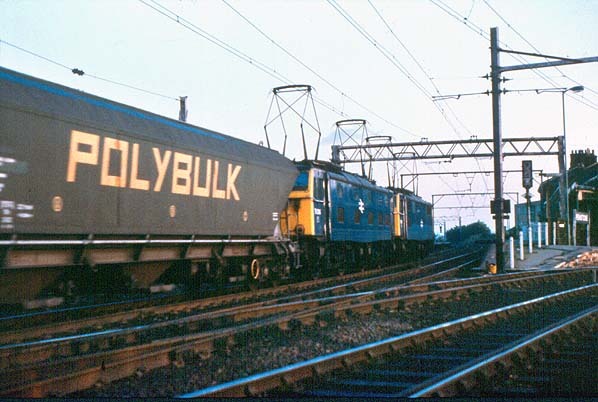 By the late 1970s, a large part of the remaining freight traffic consisted of coal trains from Yorkshire to Fiddlers Ferry Power Station near Widnes—which required a change to diesel haulage for the final part of the journey. the line was mothballed. The tracks were lifted between 1985 - 1986 ending short-term hopes of reopening. Almost the entire line east of Hadfield has now been lifted (apart from a few short sections shared with other lines, notably at Penistone). Parts of the trackbed were have now been blocked by road construction preventing any future reopening.The trackbed between Hadfield and the Woodhead Tunnel has currently been adapted as the Longdendale Trail for hikers and cyclists, part of the Trans Pennine Trail. Some text copied from Wikipedia under creative commons licence . 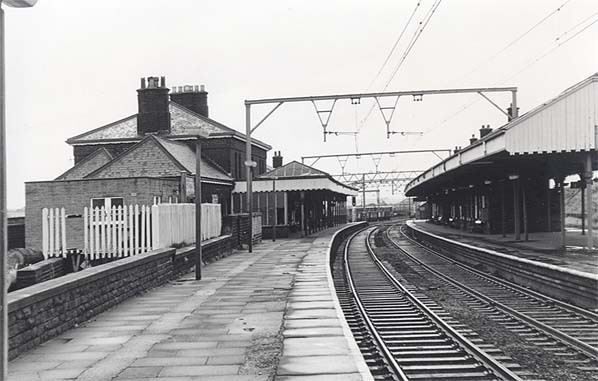 Penistone station looking north-west in the early years of the 20th century. 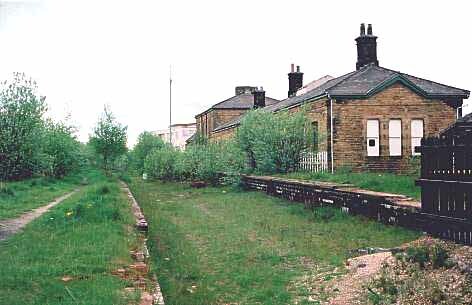 The Woodhead line platforms ared to the left. 1893 1:2,500 OS map. The building to the north-west of the main station building is a sub-station; it was built during the electrification. Looking north-west towards Woodhead tunnel five days before the new tunnel was formally opened and full electric operation began. However, electrically hauled freight trains had been running between Wath yard and Dunford Bridge since February 1952 with handover to steam at Dunford Bridge; this train was probably one of those, headed by Bo-Bo EM1 Nos. 26043 + 26042. E26053 Perseus with the RCTS Great Central Railtour at Pensitone station on 13 August 1966. The loco is in the process of running round its train which had just arrived via the Worsborough incline and was preparing to head for Sheffield Victoria. The railtour was run to commemorate the loss of through passengber workings over much of the Great Central London extension where service cutbacksa were due to be implemented the following month. 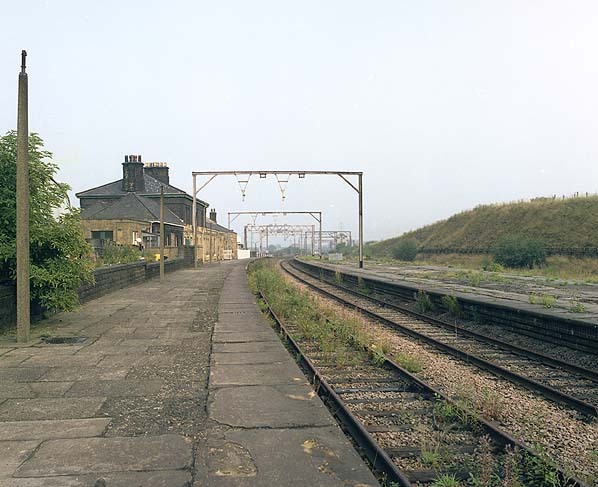 Penistone station looking south-east towards Huddersfield Junction in August 1969. 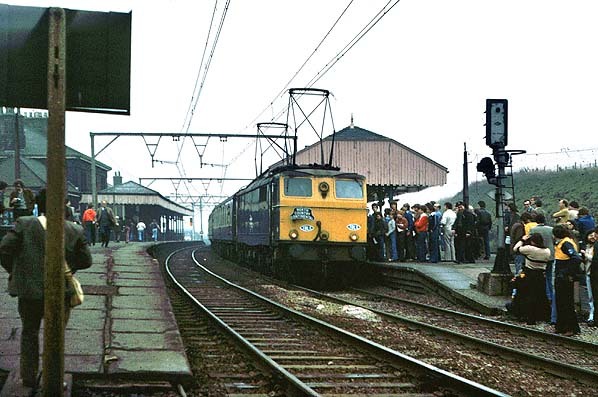 'Pennine Explorer' railtour stops at Penistone on 14 October 1978. This leg of the tour was hauled by two BR Class EM1 Electric Locomotive 76016 and 76009 (one at each end). These locomotives were from a series that was modified for multiple working for operating MGR trains over the Woodhead route in the late 60's. Introduced in 1950, these were the prodution batch of the earlier LNER built version. 76049 is seen working the Thompson B1 Locomotive Society Three Way Special (re-run) at Penistone on 14 October 1978 but carrying a North Country Continental headboard. This was the second railtour to call at Penistone on this day. Class 76’s - 76006 and 76014 head the last electric train through Penistone - the late running Harwich to Edge Hill Speedlink - shortly before 5am on Saturday 18 July 1981. Although the line closed in 1981 and the overhead power lines were removed the track was mothballed and not lifted for 5 years. Class 31, 31 113 pauses at the closed section of Penistone station in September 1986.